Halloween is a time for frights and things that go bump in the night. Nobody does it better than Universal Studios and their the Halloween Horror Nights. 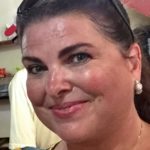 See how our Southern TravelingMom handled being out of her “scary” comfort zone for the first time in over 20 years and what tips she has for your visit this annual crowdpleaser! Treat yourself to a night of frights at Universal’s Halloween Horror Nights in Orlando, Florida. Photo by Melody Pittman / Southern TravelingMom. 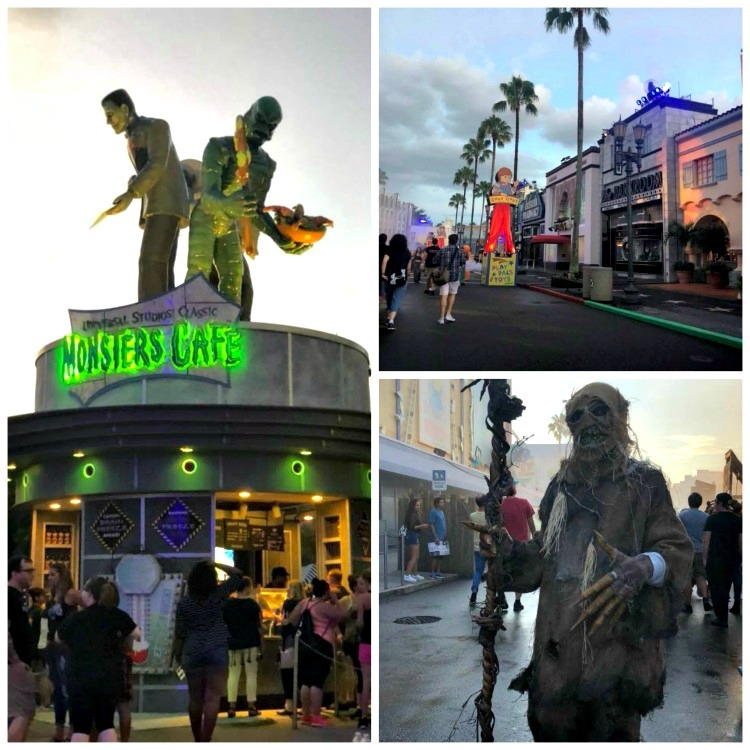 Universal Studios is not only an amazing theme park with all things related to TV and movies but also an incredible fright destination at Halloween time. 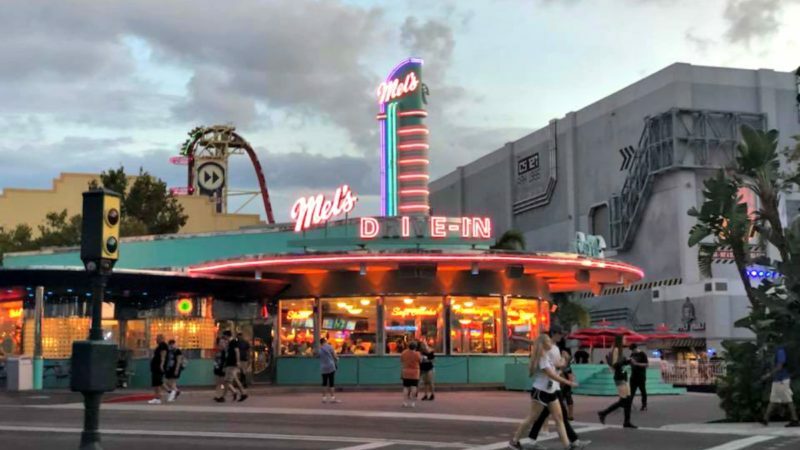 With the purchase of an evening event ticket to Halloween Horror Nights on certain dates between September 14 through November 3, the scares are unlimited. Your visit can be as frightful as you wish, based on your participation level in the offerings they have in store for you. I must admit that in my younger days, my husband and I loved a good haunted house or trail at Halloween. Getting chased by someone dressed as a gore movie chainsaw killer or possessed cat was entertaining and fun. I never thought a thing about it. Twenty years have passed since I embraced that brave spirit and truly enjoyed a good old-fashioned Halloween scare. Can you imagine paying money to be scared? Really? That is a thing? I guess the same way that we like our adrenaline-inducing adventures and thrill rides, many still crave a good scare. To my own surprise, I agreed to visit the Universal Studios this Halloween season and step out of my comfort zone for you, our readers. 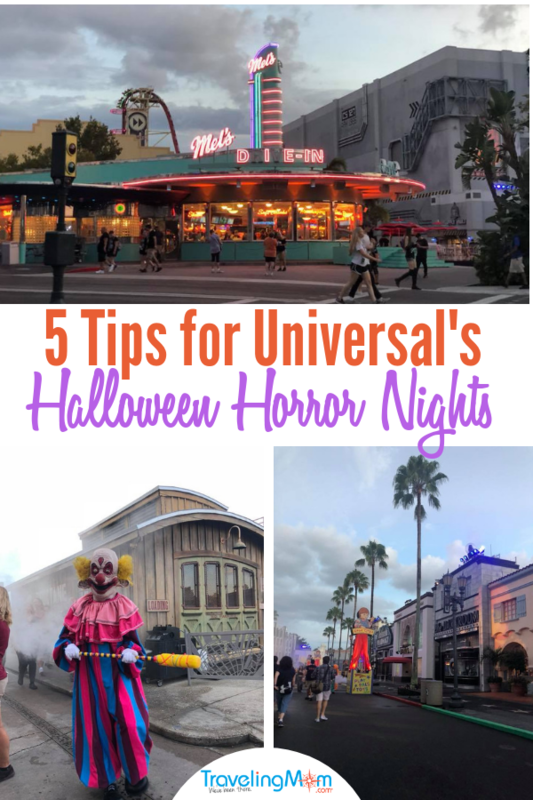 Here’s how it went and the 5 tips for Universal’s Halloween Horror Nights, to help navigate your fright night fun. After you enter Universal Studios, the paths forks in several directions. You must choose one of these to get to the park offerings; however, during Halloween Horror Nights, these are set up as scare zones. You must walk through the fright zones or cross the road to “get to the other side”, no pun intended. This year’s Halloween Horror Nights’ zones included Killer Klowns from Outer Space, the Harvest, Twisted Tradition, Vamp ’85, and Revenge of Chucky (nightmare toys). Vamp ’85 was my favorite with a zombie Michael Jackson, Prince, and other favorites from the 1980’s. Don’t worry, no one is allowed to touch you at Halloween Horror Nights, but they do come at you, and with a greater vengeance the later in the night it is. You can reduce that fright by staying on the sidewalks, a safe zone of sorts, for those who aren’t in the mood for a good hair-raising scare. TravelingMom Tip: Download the Official Universal Orlando® App to help find your way around the park. 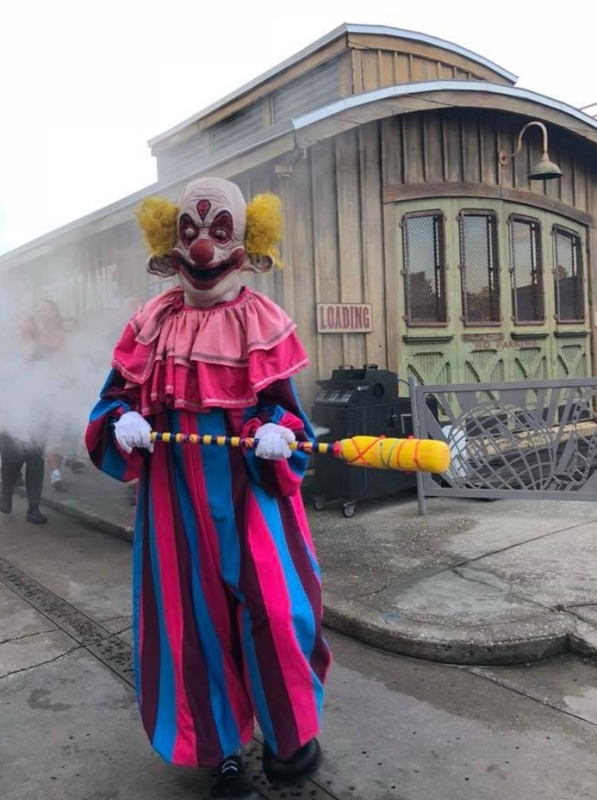 A killer clown awaits you in one of the Halloween Horror Nights scare zone. Photo by Melody Pittman / Southern TravelingMom. It is still daylight when the doors open for the special Halloween Horror Nights celebration. This makes it must more digestible for passing through the scare zones and entering the houses since you can see what each is made up of. This was key for me settling into a place where I actually laughed at the zombies and monsters as opposed to being scared. Universal does a fantastic job with make-up and theatrics, so the “spooks” you meet are the real deal…very convincing! If you crave the utmost scares, skip the daylight and wait until it is fully dark outside to visit. TravelingMom Tip: This event may be too intense for children and is not recommended for those under 13 years old. No costumes or masks are permitted from those in attendance. The scare factor intensifies greatly as the sun goes down on Halloween Horror Nights. Photo by Melody Pittman / Southern TravelingMom. Since the Halloween Horror Nights require a separate ticket, this is your chance to take full advantage of the Wizarding World of Harry Potter being desolate, and probably the only time you will find that. I was one of the “fraidy-cats” that chose to hang out here. It was fun to enjoy the Hogwarts and Harry Potter attractions without the big crowds while the rest of the park went all out for frights and haunted houses. This is the perfect opportunity to savor your Butterbeer, get great photos of Diagon Alley without shoulder-to-shoulder crowds, and see every square inch of this part of the park. TravelingMom Tip: The Wizard World of Harry Potter closes at 11 PM. 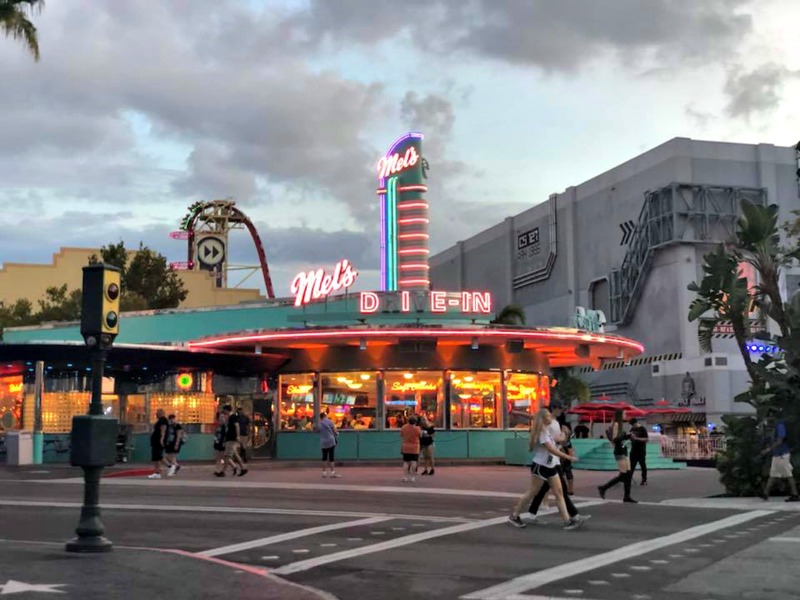 Universal’s Halloween Horror Nights feature all sorts of special food offerings for the big event. Sink your teeth into Twisted Taters (thin-sliced potato kabobs) with bacon and cheese or the Pizza Fries, the biggest hit of the year. Other nom-worthy items include a variety of waffles, Christmas Tree-lights cupcakes, and “blood” covered mini-donuts. If a sit-down experience is more your style, you’ll go nuts for the Scareactor Dining Experience at Classic Monsters Cafe. Partake in a themed buffet dinner event that includes photo-ops, a digital download photo, and one non-alcoholic beverage. 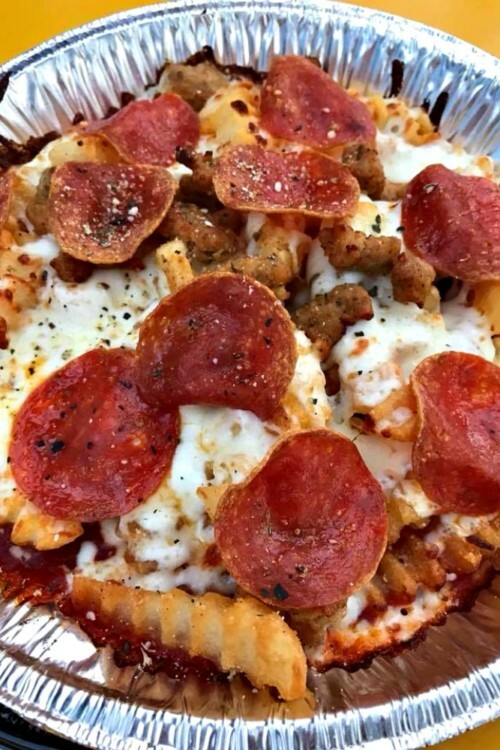 Pizza fries piled high with sausage, pepperoni, and cheese. Photo by Lisa Cameron. An Express Pass costs a little more ($79.99 vs. $62.99), but it will be worth it so you don’t have to spend so much time waiting in lines. The express pass will help you move to the preferred line for the haunted houses, rides, and attractions. If you don’t originally buy the express pass, they go on sale inside the park at 10 PM. The difference in wait times was quite a lot. For example, 25 minutes with Express Pass for the Stranger Things house at 6:45 PM versus 65 minutes without. The wait times increase as it gets later in the night. I was so thankful to have it from the get-go. TravelingMom Tip: Poltergeist, Stranger Things, and Halloween 4 are the most sought-after attractions; do them early for the shortest wait time. 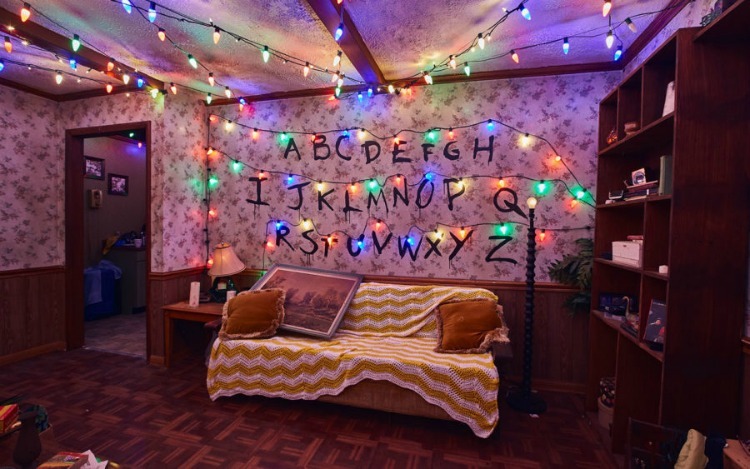 The Stranger Things house is the biggest hit of Halloween Horror Nights 2018. Photo property of Universal Studios. I had such a good time at Universal’s Halloween Horror Nights! For myself, it was as much fun as it was scary. I’m sure that being at the park during daylight hours helped ease my anticipation of how scary it would be. Once I saw the layout and knew what to expect, my night was really fun. I’m already making plans to go back next year. Universal has won “Best Halloween Event” 10 years in a row from Amusement Today’s Golden Ticket Award. What’s your favorite Halloween event at Universal? Photo by Melody Pittman / Southern TravelingMom.